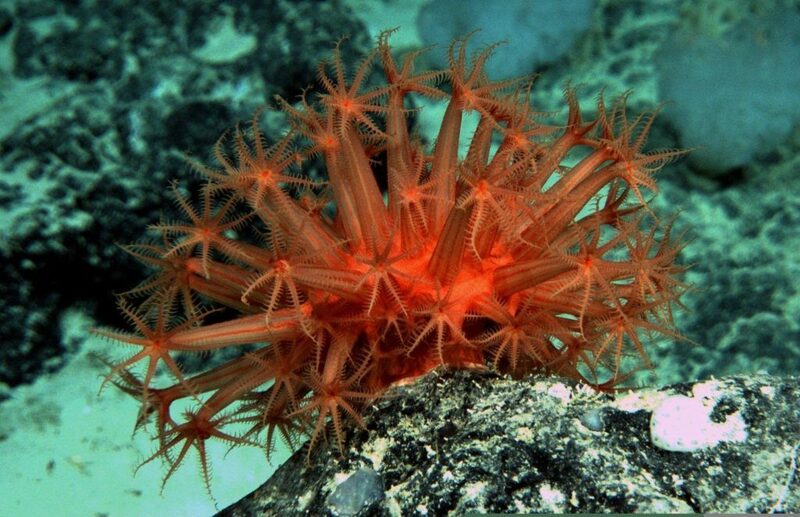 Anthomastis is just one of the many marine species that call seamounts home. There’s lots to love about Tasmania – fine food, fine wine and fine wildlife. But did you know that off the coast of our southernmost state, there are over a hundred underwater mountains that are home to some of the most diverse marine communities in the world? These underwater mountains, known as ‘seamounts’, are teeming with coral, sponges and animals that live above the shifting sediments of the seafloor. Unlike shallow corals, these cold-water corals live 700–1500 metres beneath the surface, and don’t need sunlight and algae to survive; instead they filter particles of food from passing currents. One species forms large areas of reef inhabited by countless other animals such as sea stars, crustaceans, worms and fish. The seamounts also provide a home for commercial fish species such as Orange Roughy and Oreo Dories. Past fishing of these species has led to impacts on coral communities, so we aim to understand how the coral is recovering. It also helps that most are now protected in marine parks. Our deep towed camera gives us front row seats to the sea bed. We are helping to produce the most comprehensive maps of these deep-sea coral habitats in Australian waters, as part of a four-week voyage on our research vessel Investigator. The survey follows previous voyages in 1997 and 2007 and will re-sample seamounts in the Huon and Tasman Fracture marine parks, to see how the coral reefs have changed following 20 years of protection from fishing. Conducting repeat surveys enable us to track any changes, and will provide the world’s science community with important data on the nature and extent of changes in deep-sea communities, and how quickly they recover. This will help us to manage these communities for the future. 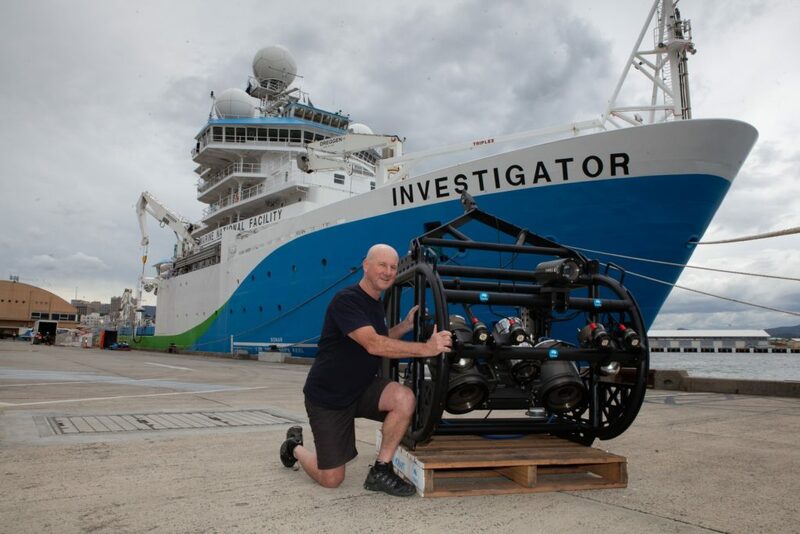 Our researcher, Dr Alan Williams, will use our deep towed camera technology to get a sneak peek into deep sea coral communities. To carry out this research, we’ll be using a deep towed camera, specially designed and constructed by us, to take close-up imagery at depths up to two kilometres below the sea surface. This specialised equipment is built to withstand the high-pressure deep-sea environment so we can go where we’ve never gone before. Getting a birds-eye view, or in this case a fish-eye view, of the deep-sea, the camera will enable us to estimate the condition and recovery of the corals. We can also look at previously fished areas of the seafloor from a decade ago to search for signs of new coral growth. 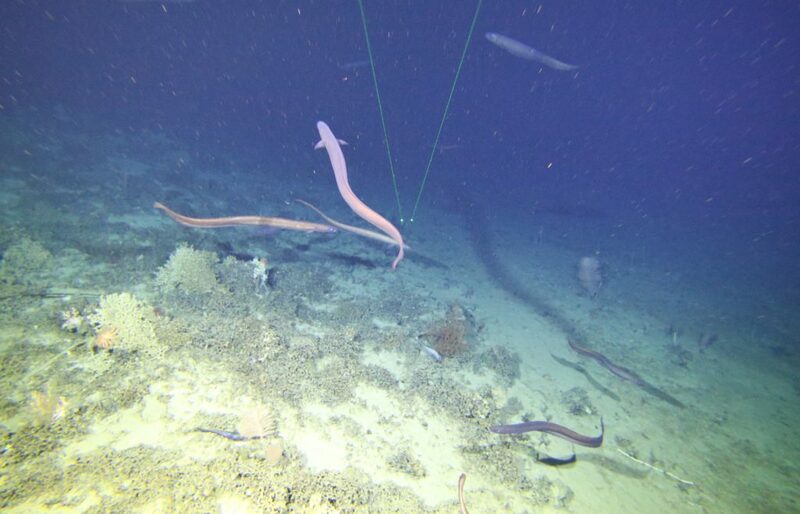 On a previous seamount survey, we sampled a massive concentration of large basketwork eels in the Huon Marine Park (the only known deep-sea eel spawning aggregation in the world). We’ll be sampling and surveying the size of this eel population, and checking whether they are there to spawn. The survey will also provide a snapshot of fish distributions. Science is a team sport and for this voyage we are working with the Marine National Facility, the National Environmental Science Program Marine Biodiversity Hub, Australian Museum, Museums Victoria, Tasmanian Museum and Art Gallery, NIWA (NZ), three Australian universities and marine park managers from Parks Australia. You can visit a daily blog to find out what we discover on this voyage. You can also add seamounts to your ‘Why I love Tasmania’ list! Does unhappy coral make it rain? Squid attack clip: Mystery (still un)solved! What creatures lurk in the deep abyss?